We strive to provide a learning environment at Let's Imagine that if fun, academic and stimulating in all areas of development-physical, social and emotional. 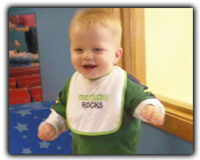 Infant Program - Our program for children age 6 weeks to 14 months emphasizes individualized care by loving, nurturing caregivers who are responsive to the needs of each growing child. They provide for each stage in your infant's development-encouraging language acquisition, appropriate social interaction, and sound physical growth - all in a colorful, multi-sensory environment. Young Toddler Program - Our program for toddlers (14-24 months) recognizes this stage of your child's growth as one of curiosity and exploration. Teachers concentrate on developmental goals of this age. 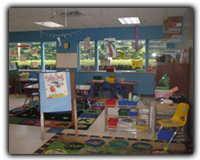 Our environment is specially designed so children can explore and play together as they begin their understanding of socially appropriate behavior. 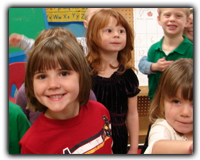 Toddler Program - Our program for two year-olds offers a secure, loving environment, with an established routine and schedule. Weekly themes are introduced which incorporate the developmental goals of the program. This begins the process of a structured day where planned educational activities and creative play time offer a balance in your two year-olds development. 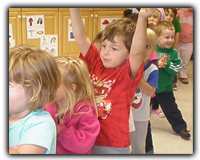 Preschool Program - Our program builds on the fundamentals of the two-year old program. We create a learning program using resources from High Reach Learning Curriculum that focuses on exposure to shapes, colors, and numbers. Other areas include: sharing and conversation time; stories, songs, and finger plays: creative art activities, crafts, games and large muscle activities; food prep, science and nature activities. 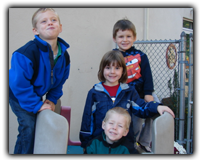 Pre-K Program - Our exciting curriculum is designed to balance work and play to awaken a student's love of learning. The emphasis of this program is on providing for the foundational development of positive self-image, and providing continual, developmentally appropriate cognitive instruction and exploration. The Pre-K program is fairly structured and academic. Hands-on and manipulative activities will help focus your child's readiness skills and prepare them for an academic Kindergarten. School-Aged Programs - Our program for before and after school care (up to first grade) gives parents the peace of mind knowing that their child is in a safe and supervised environment before and after school hours. It is designed for the ever-changing needs of today's active children, and is responsive to the normal interests and developmental needs of your school-aged child. During public holidays we offer a full-day schedule that is rich in hands-on activities. During our summer session we offer a variety of structured activities for the children, which are filled with fun and education on a daily basis.